Wind up music box, key inside the box. The recipient may wish to replace the sentiment in the frame lid with a 4" x 6" horizontal photo of their choice; easy to insert. Insets on the bottom of the box will protect your fine furniture. 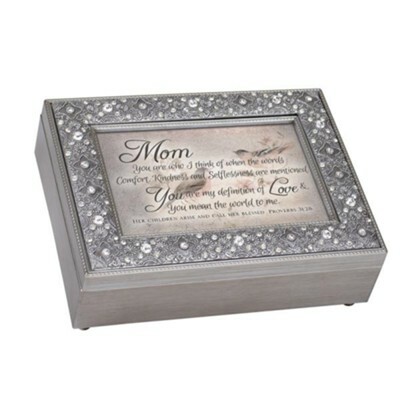 I'm the author/artist and I want to review Mom You Are My Definition of Love Filigree Music Box.